Silver and Natural Stones CollectionsThis is another exclusive creation from GsS. Agates come in many different varieties. Some say its name derive from Greek and means happy. Product DetailsThis product is 925 Silver. This product dimensions are approx. 43 mm *50 mmThis product weight is approx 13 grams.This product size category is XL. We have 5 size categories (xs=extra small, s=small, m=medium, l=large and xl=extra large). Please click here to find out more about pendant sizes. 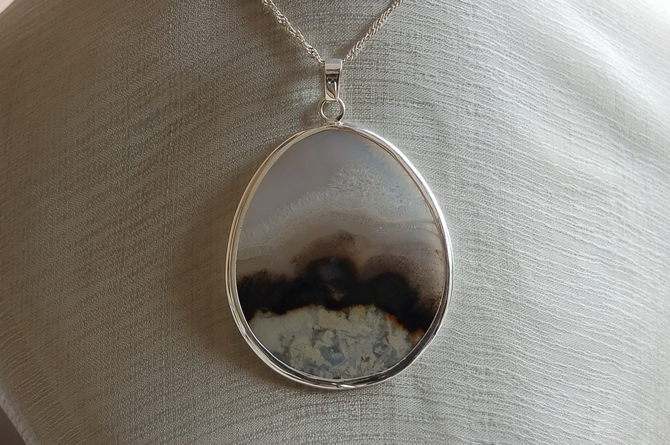 Note that this product does not come with a silver chain - please check below selected chains for this product or check the chains section of our siteAbout the stone: Agate is the birthstone of Taurus and is also the anniversary gemstone for the 12th year of marriage.